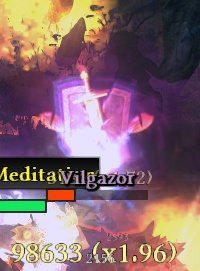 I want to bring the attention to something that I don't completely like about the UI: the status icons that appear above enemy heads, the ones that show DA/OA/Res reductions or other spell effects/celestial powers. In particular i feel there are two problems. 1)They appear above every enemy affected so, if there are many of them, they clutter the screen, especially with some skills/enemies. Here an example, imho the game would look a lot better and more clear without them. But this way you'd lose precious info, right? Well, maybe give us an option to remove them only from trash mobs and keep only for heroes+, since i think it's not that important knowing that a trash enemy, with an average life of few tenths of a second, has some oa/da debuff. 2)They stack above each other, so it's difficult to tell if the x effect is active on that enemy. And I think not every spell has a related icon: for example, you can't tell if the RR from the X skill/celestial power is active or not. I know that making changes at this stage of the project is unlikely, but it'd be cool if at least something minor could be implemented. Here's something (i think it's wip) that our lovely author of GRimInternals did, notice the 2D status icons near the enemy name. Honestly, i don't like where they are placed and imho would be cool to see them under the enemy bar, like the arrow shows. But these icons may be, in some cases, more informative and useful than the ones above enemy heads. 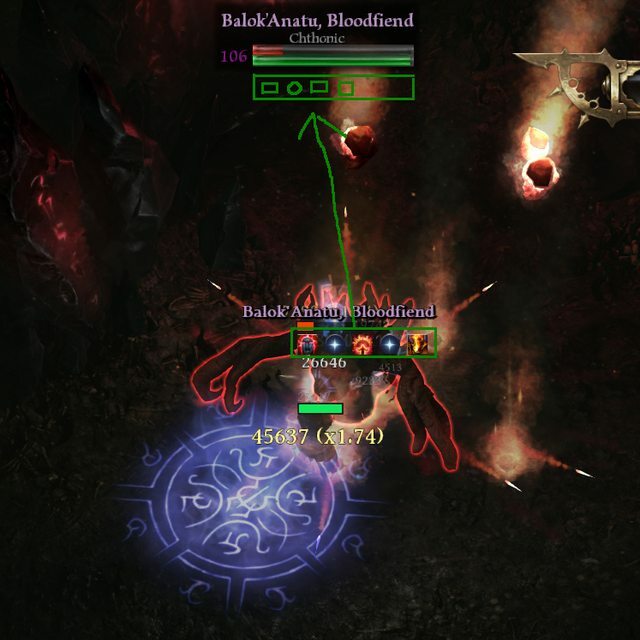 For example, in this case, they show two important thing: they tell me that enemy is affected by my Aura of Censure and its RR, plus it tells me that enemy has a termite mine debuff. This info imho is really important since it tells me i don't have to move closer to let enemy be inside of my aura, or recast the mines. Just wanted to give my 2 cents about these little problems of this wonderful game, hoping Crate will make some small changes if they have time, like removing some icons from enemy head in order create less clutter, or addinga new 2D icon system similar to the GrimInternal one. Last edited by Vastator; 04-17-2019 at 04:37 PM.